You can see Nativity Scenes popping up every year around Christmastime. At churches, at stores and around shopping centers, in grandparents' living rooms. The arranged meeting place of wise men, shepherds and their flocks, and the new family of Mary, Joseph, and baby Jesus. This is one of Christmas's best known stories, so it's not a surprise that you can find these almost everywhere. But a nativity scene wouldn't be complete without adding Saint Joseph. He was the loyal husband who stuck with Mary through it all. He lead his new family through the desert and into the city to pay their taxes and helped find shelter for them when there was no room for them in nearby lodging areas. You can see him depicted in different nativity scenes with a tender look on his face as he observes his wife and the newborn baby. So, he's a pretty important guy. 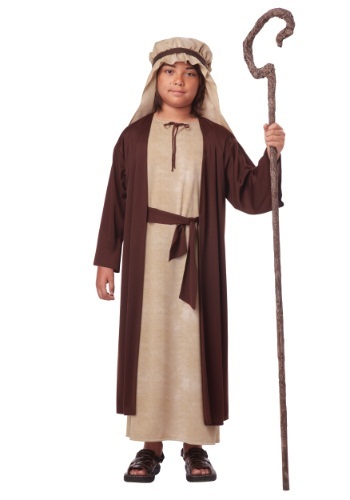 Make sure you've got a good Joseph costume when you're planning your own living nativity scene this Christmas. We'd suggest this Boys Saint Joseph Costume. It's a 100% polyester tan robe that has ties by the collar. The brown overcoat is attached to the robe and ties around the waist. Included with this costume is a headpiece that is stretchy and ties around the head. Not included, but something you'll want to add to this, is a good pair of sandals and a shepherd's crook. Be sure to check our accessories store for both of these!